The influential country music singer and songwriter died alone in the backseat of his cadillac New Year's day 1953. He died much as he had lived — drunk, forlorn, suffering from a birth defect, wondering when the bubble would burst. Having sprouted out of nowhere, like a weed in the wilds of south Alabama, he was gone at the age of twenty-nine. Now, with this definitive biography of the man and his music, Paul Hemphill takes the reader on a journey through hw life and times: his dirt-poort beginnings as a sickly child, learning music from a black street singer, refining it in raucous honky-tonks during the depression, emerging as a star of the Grand Ole Opry. 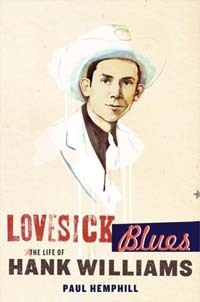 Undeducated, virtually fatherless, an alcoholic in his teens, unlucky at love, Hank mined his experiences to write songs that will live forever. Paul Hemphill, author of The Nashville Sound and the song of a long-distance trucker from Alabama, brings his background to bear on a story that often reads like fiction. He has unearthed many fresh details in Williams's life, but most important, he has explained that life and given it the lively telling it deserves. Paul Hemphill was born and raised in Birmingham, Alabama. he is the author of four novels and eleven works of nonfiction. All of them dealing with the blue-collar south. He lives in Atlanta, Georgia.